On the evening of May 23, 2000, I had a major lesson in music performance royalties. Blues legend Son Seals from Chicago did the song “Let It Go” on the “Conan O’Brien” show. He performed the song at approximately 2:30 a.m. EST (New York time), 1:30 a.m. CST (Chicago time). I wrote that song and owned the publishing rights, so I received 100 percent of the composer royalty paid through the American Society of Composers, Authors and Publishers. The check I received was $1,500 for that one performance, the rate for a song performed after midnight EST on network television. A song performed or played on the air in prime time 7 p.m. to 12 a.m. EST would have paid about $2,700. You now know why all music on talk shows is played after midnight — the royalty savings are substantial. The power of writing royalties is also evident in this lesson, as I made more money that night than Son Seals, who received about $300 as a performance fee. Songwriters vs. the musical performers get paid for media play on network radio, TV and film. Songwriters also get paid for music sales. 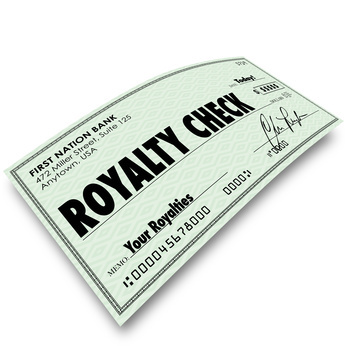 Royalties are paid from several sources, the primary two types of royalties are mechanical and performance. Mechanical royalties are paid from the physical or download sales of recorded music. These royalties are paid usually by a record label to the performers and the writers of recorded music. Songwriters get paid generally at a rate of 9.1 cents per unit sold or downloaded. This statutory rate is set by Congress for the writer and his or her publishing company. The amounts paid to performers are based on a contract from the record label. For example, a beginning artist will generally get 7-14 percent of the retail sales price of a recording, minus the cost the record label paid for the recording. If you sell 100,000 downloads of a single song at $1, your royalty might be 0.13-0.27 cents per download for a total of $13,000-$27,000, less the cost to be repaid to the label. The net profit is split among the band members according to their agreement. The composer or composers of this song would receive 9.1 cents: 50 percent paid to the artist, and 50 percent paid to his or her publishing company. So for the 100,000 downloads example, the songwriting royalty would be $9,100 with no cost to pay back. Performance royalties are paid by media for radio, television, satellite and Internet air play every time a song plays. These royalties are paid primarily to the music composer. If you have performed on any music being played on Internet or satellite radio, you are entitled to a very nominal royalty. Note: In the rest of the world, performers are paid for all media play. The U.S. and Brazil are the only two countries in the world that have not signed the International Convention for the Protection of Performers, Producers of Phonograms and Broadcasting Organizations (referred to as the Rome Convention). This agreement pays performers of music a royalty for media play. The U.S. Congress allowed the formation of www.soundexchange.org as an olive branch. This allows performers to get paid for public performance of music on Internet and satellite radio. The sad fact is that American artists’ royalties are being paid in all these countries, and the governments of the world are keeping the money. Performance royalties are collected and disbursed by two nonprofit composer organizations, ASCAP and Broadcast Music Inc. These organizations collect the air play information by reports submitted by the media or surveys. Since performance royalties are difficult for artists to verify, they must belong to and rely on either ASCAP or BMI. The network radio stations pay about 1 cent per play, compared to Internet radio streams that pay about 0.00495 cent per stream. Music used in film and television pays varying amounts according the time of day of a broadcast. These fees are not royalties but negotiated contractual use of music in film and television commercials. These fees are paid to the composer and publisher. For more information on music royalties, visit the ASCAP and BMI websites.